When I heard that a Tolkien conference was going to be held in New York City last month, of course I paid attention, as I find any reason to visit New York a welcome one. When I investigated further and saw the list of presenters — Janet Brennan Croft, Kristine Larsen, Nicholas Birns, Laura Lee Smith, Chris Vaccaro, Dawn Walls-Thumma, and others who kept getting added to the roster — I was convinced I had to go. 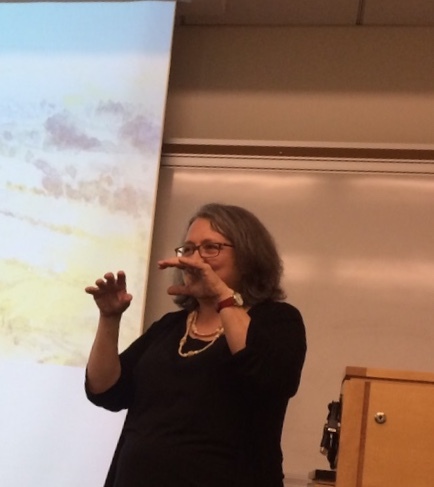 The conference gave me a great opportunity to talk about my research on Tolkien’s art, and I was also pleased to be invited to participate in the Women in Middle-earth roundtable (more on my sessions below). Plus, as with most conferences, it was a chance to catch up with friends and meet new people. 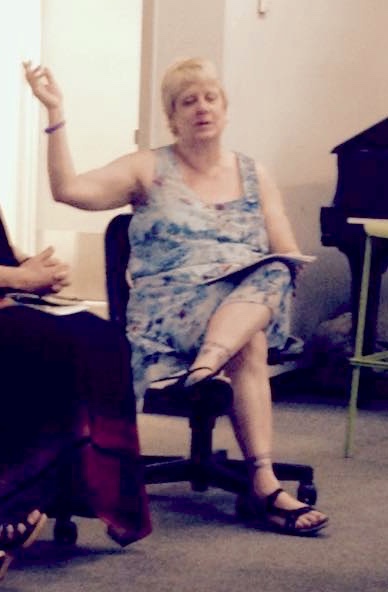 Organized by Anthony Burdge and Jessica Burke, the conference featured Janet Brennan Croft as the Scholar Guest of Honour. 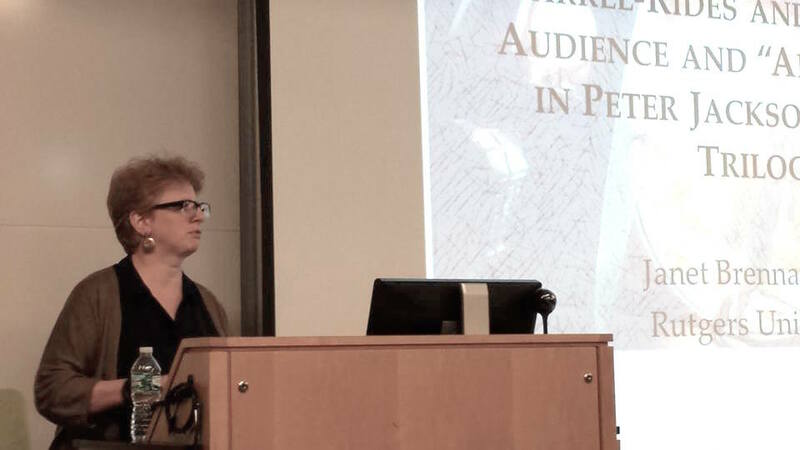 Janet’s keynote, “Barrel-Rides and She-Elves: Audience and ‘Anticipation’ in Peter Jackson’s Hobbit Trilogy,” started off the day’s proceedings. Janet pointed out the challenges that Jackson faced in making The Hobbit, which is supposed to be a prequel to The Lord of the Rings, but was made after what is supposed to be its sequel. Following me? If not, you can always look up a version of Janet’s talk, complete with diagrams illustrating the internal and composition chronologies of versions of The Hobbit and The Lord of the Rings, here. Janet used Tolkien’s criticisms of Zimmerman’s screenplay as a way of discussing some of Jackson’s issues in trying to make The Hobbit and The Lord of the Rings a seamless sequence, including problems of tone, audience, plot structure, and characterization. After the plenary, it was time to disperse to various sessions. The conference call for papers had elicited so many presentations for this one-day event that the speakers had to be divided into four or five concurrent sessions for every timeslot. I found myself wishing that I could be in two or three places at any one time throughout the day. Luckily, two of the sessions were taped and posted online, so if you were in another room or just stayed at home, you can still listen to Dawn Walls-Thumma talking about “The Loremasters of Feanor: Historical Bias in the Works of J.R.R. Tolkien and Transformative Works.” This link will take you to a page that also includes the text of her talk and the slides that she showed. The other taped session was “History and Technique: Sourcing the Arms, Armor, and Fighting Techniques of Middle-earth” featuring Rebecca Glass and Kat Fanning (if you follow the link, you’ll have to scroll down the page to their video). I attended two regular sessions other than my own. First up was Kristine Larsen‘s paper, “‘While the World Lasted’: End Times in Tolkien’s Works.” Kristine talked about Tolkien’s references to the end of the world, mainly in The History of Middle-earth, The Fall of Arthur, and The Legend of Sigurd and Gudrun, and commented on the prevalence of this theme in his work in the 1930s. 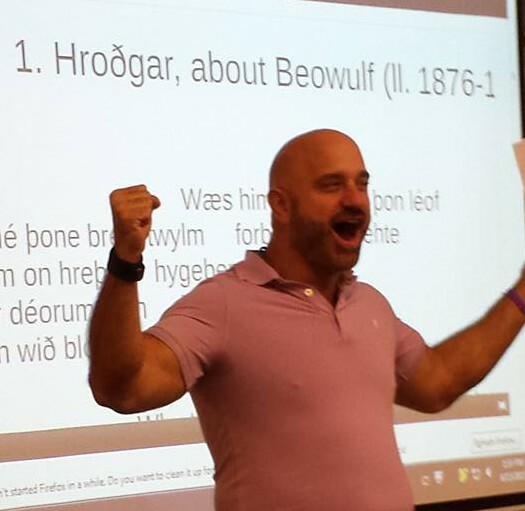 Chris Vaccaro‘s presentation on “Affection Between Men in Tolkien’s Beowulf” took a look at the way in which a phrase from Beowulf, “dyrne longath,” has been rendered by many different translators, with interpretations varying widely: do the words refer to deep feelings? secret longings? affection? Chris looked at departure scenes in Beowulf and in Tolkien’s work in the light of this phrase. It was certainly a day packed with ideas and events. I was part of the Women in Middle-earth roundtable discussion along with Janet Brennan Croft, Jessica Burke, Rebecca Glass, and Kristine Larsen. We had a free-ranging discussion about various characters, our first-time reactions as readers and/or movie-goers, and critics’ views of women in Tolkien’s works. One of my points (based on a lecture I had heard recently) echoed the concerns that Janet and her co-editor, Leslie Donovan, express in their recently published anthology, Perilous and Fair: Women in the Works and Life of J.R.R. Tolkien — that any literary critic who wants to talk about women in Tolkien’s life and work should be informed about previous and current research on the topic. That doesn’t mean that they have to agree with other critics’ opinions, but they shouldn’t just repeat cliches or make statements as if they are the first to look into the question without investigating further. I recommend this book for its combination of older essays and new research for anyone interested in the topic of women. I was scheduled to give my paper in the last regular session, and thankfully even near the end of a very full day some people showed up and offered interesting comments and questions. My presentation, “‘If you’re a vivid visualizer’: Words and Images in Tolkien’s Sub-creative Process,” extends some of the research that my colleague Jeff MacLeod and I have been doing on Tolkien’s artwork and his visual imagination and style. (We have one essay published, “A Single Leaf: Tolkien’s Visual Art and Fantasy,” and another one on Tolkien’s painterly style that has just been submitted to a journal). 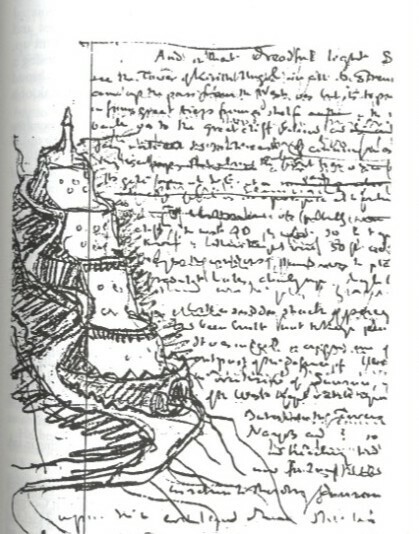 My basic question for this presentation was: what can a manuscript sketch such as the Tower of Kirith Ungol (still spelled with a “K” at this point) tell us about Tolkien’s process of composition? How do words and images interact in Tolkien’s drafting of the story? You can find this image in Hammond and Scull’s book, J.R.R. Tolkien: Artist and Illustrator, and in The History of Middle-earth, the Sauron Defeated volume. I’ve also been fortunate enough to look at a digital scan of the manuscript at the Marquette University Tolkien archive. In my presentation, I talked about the placement of the sketch on the page, the sequence of pencil and pen drafting, and the effect on the wording of Tolkien’s draft of the story at this point. To set up the ideas for this manuscript examination, I showed examples of Tolkien’s artwork and talked about how he is a “vivid visualizer.” This opening quotation in my presentation title comes from “The Notion Club Papers,” an unfinished story that you can find in Sauron Defeated. In this time-travel story, Tolkien describes characters with different talents: some are vivid visualizers, others have a predilection for words and languages. Sometimes in the story those two abilities working together enhance the characters’ understanding. I talked about how a sketch like the Tower of Kirith Ungol shows this close interplay of words and images in Tolkien’s creative process. To round off our busy day, we had one closing plenary session. A copy of the 2005 Ring Goes Ever On conference proceedings * was given to Baruch College librarian Chris Tuthill as a gift from the Tolkien Society’s Tolkien to the World program. Then we sat back and listened to the Minstrel Guest of Honour, John diBartolo and The Lonely Mountain Band, who provided some lively music to close out the fellowship of the day. You can sample their music from the links on the conference blog. By the end of it all, Anthony and Jessica’s question about whether they should make this a regular event was met with an enthusiastic yes. You can read abstracts of all the presentations here. For accounts of different paths through the program from mine, you can read Myla Malinalda’s description of the sessions that she attended on Middle-earth News or Dawn Walls-Thumma’s report for the Signum Eagle newsletter, “The New York Tolkien Conference: Friends and Fellowship.“ And if you’re interested in knowing about future meetings, you should subscribe to the conference blog, follow @herenistarion on Twitter, or join the Facebook group. Although the conference was only a one-day event, I did extend my stay in New York by a few days. Accompanied by my daughter, we took full advantage of the city: we visited museums (the Frick, the Guggenheim, a few galleries in the Met); we went boating in Central Park and walked on the High Line; we saw a play, Skylight; a musical, An American in Paris; a performance by the Alvin Ailey dance company; and we took advantage of free Shakespeare in the Park tickets to see The Tempest. Add to that a day of Tolkien fellowship — well, that’s not bad for a four-day trip. 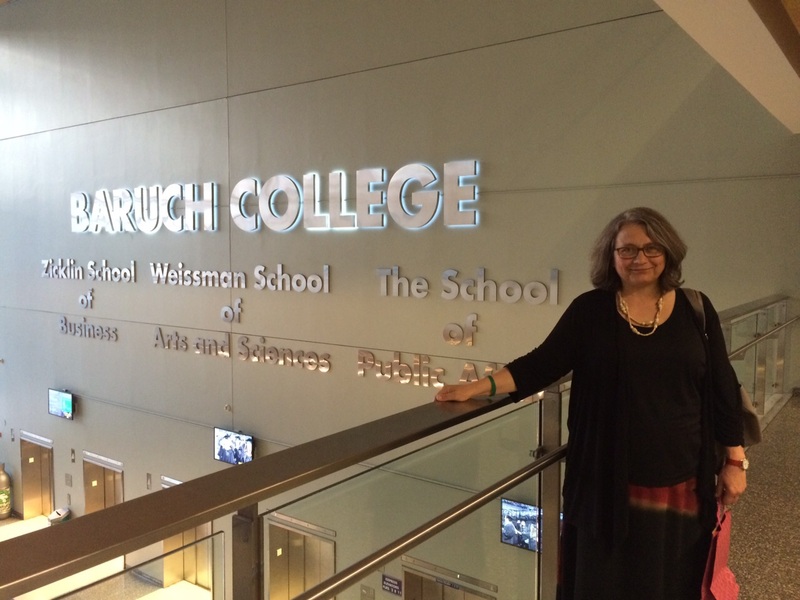 *Among the many essays in the 2005 Ring Goes Ever On volumes donated to Baruch College you can find an essay by Kristine Larsen, “‘A Little Earth of His Own’: Tolkien’s Lunar Creation Myths” and one by me: “Male Friendship in The Lord of the Rings: Medievalism, the First World War, and Contemporary Rewritings,” which you can read here. Please feel free to comment on your own experiences at the conference or to provide links to any other accounts of the event that you know of. Or just tell us your thoughts!